Happy NYE to those of you in time zones where it hasn’t happened yet! (Sorry, Australia and thereabouts, I missed you all.) I’ll be ringing in the new year on a rooftop in downtown Chicago, freezing in the name of fashion and a good celebration. It’s been an interesting year in many respects, and I’ve had a ton of fun in launching this website, jumping right in to the world of music bloggers, and meeting tons of new people. I’m looking forward to an even more interesting and music-filled 2010. Now to the most pressing matter… I doubt that many of my top five choices will be a surprise to anyone, although two of the albums here were latecomers, sort of sneak-attack albums that popped up and grabbed my attention recently. To see my other top choices of 2009, check out albums 6 through 10, 11 through 15, and 16 through 20. Without any further procrastination, I bring you (in alphabetical order), my five favorite albums of the past year. 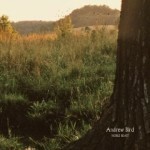 Look, I’ve talked about Andrew Bird, and about this album, all year. I love this album, it’s that simple. I think it’s in a different category than The Mysterious Production of Eggs, which was Bird getting his feet wet and experimenting with putting out a full-fledged solo effort, or Armchair Apocrypha, which is as close to a rock album as Bird may ever get. Noble Beast may be playing it safe, but this album is much smoother than its predecessors, and it really seems to tap into the whole natural world sort of vibe that’s run through Bird’s music in the past. From the lyrics to the photography, from Diane Sudyka’s gorgeous artwork to the album’s title itself, Noble Beast is saturated in Bird’s love of the natural world. An additional nod of appreciation goes to Useless Creatures, the bonus disc packaged with the deluxe edition of the album. Useless Creatures is Bird’s “self indulgent” album, an eclectic mix of instrumental work, which may in fact be more innovative than anything on Noble Beast. Noble Beast was released January 20 by Fat Possum. The Decemberists, The Hazards of Love. I thought that maybe I would get tired of this album as the year’s gone on, but I haven’t. This album gave Colin Meloy and company a chance to show off their prog rock leanings, a tendency that’s always been a bit buried beneath the hurdy-gurdy and the Civil War-era tinkering. This album is best appreciated as a whole unit rather than as individual songs, although “The Rake’s Song” seems to hold its own outside of the album. I love this album because it’s just so different from what we’ve been seeing recently. In a time where the mainstream media keeps trying to tell us that the album is dead, the Decemberists have shown that you can still put together a solid hour of cohesive music and make it awesome. 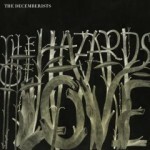 The Hazards of Love was released March 24 by Capitol. If there’s any such thing as a perfect indie pop album, Reservoir might just be it. Everything about this collection of songs just feels good. I regrettably didn’t discover how much I loved this album until after I’d missed the band’s show at Schubas, but I’m hoping they swing back across the US and make it to Chicago again in 2010 so I can make up for that. What’s not to like about this album? There are catchy songs, trumpets and mandolins and plucky violin notes. It’s enjoyable all the way around. 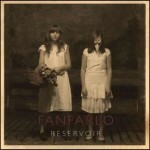 Reservoir was released September 29 by Atlantic. 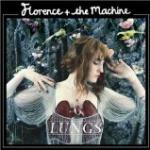 Florence and the Machine, Lungs. Handclaps! A crazy disco pop sort of sensibility! Strong female vocals! This album was made for me to love. I didn’t expect to love this album as much as I do, but for a while there, I couldn’t stop listening to it. The songs here are equally at home in a dance club or as background music to hilarious scenes on TV (see: “Kiss With a Fist” on the Christmas episode of Community). I’m interested to see what Florence Welch follows up Lungs with, and whether or not it will be able to top this. Fingers crossed for 2010. Lungs was released on October 20 by Island. It might not be fair to put this album on my favorites list, as I’ve just discovered it within the past month or so, influenced by the album making appearances on several other Best of 2009 lists. But I haven’t really stopped listening to it since finding it, so I think that makes it a fair inclusion. With vocals that at times remind me of a rowdier, Frames-era Glen Hansard, with banjo and bluegrass and tambourine and some incredibly tight folk drumming, this album definitely took me by surprise and hasn’t quite let go yet. Here’s to hoping that the album sees a release here in the US and that they hit a few more cities here than just NYC and LA/San Francisco. 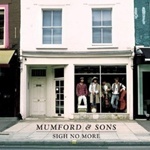 Sigh No More was released on October 5 by Island. And while you’re still reading, here are some other albums which I’ve enjoyed throughout the course of the year, but just didn’t get to know them well enough to bump them up onto my top 20. Don’t worry, extra list of albums, you’re still some great, great music. The Antlers, Hospice / Antony & the Johnsons, The Crying Light / Bill Callahan, Sometimes I Wish We Were an Eagle / Bon Iver, Blood Bank EP / Brandi Carlile, Give Up the Ghost / Camera Obscura, My Maudlin Career / Cass McCombs, Catacombs / Dave Matthews Band, Big Whiskey And The Groogrux King / Dirty Projectors, Bitte Orca / The Flaming Lips, The Dark Side of the Moon / Grizzly Bear, Veckatimest / Hockey, Mind Chaos / Jesca Hoop, Hunting My Dress / Jim Gaffigan, King Baby / jj, jj n° 2 / Kelly Clarkson, All I Ever Want / Kid, You’ll Move Mountains, Loomings / Lady Of The Sunshine, Smoking Gun / M. Ward, Hold Time / Miike Snow, Miike Snow / The Mountain Goats and John Vanderslice, Moon Colony Bloodbath EP / Patrick Watson, Wooden Arms / Patrick Wolf, The Bachelor / Patton Oswalt, My Weakness Is Strong / Rodrigo y Gabriela, 11:11 / Regina Spektor, Far / Tegan & Sara, Sainthood / Thao with the Get Down Stay Down, Know Better Learn Faster / Vandaveer, Divide & Conquer / Yeah Yeah Yeahs, It’s Blitz!